Atheism is not a satisfactory solution to life. It may be the truth — I’ve thought so for fifty-five years — but it isn’t satisfactory on many levels. Religion, and it doesn’t much matter which one, is quite satisfactory, as long as belief holds out. The problem of death is solved by not dying, not really, just moving on to the next step in an ongoing life. I really miss the comforts of that belief. The question “why are we here?” is not really solved, but it gets kicked upstairs to the fellah at the higher pay grade, so we can stop worrying about it. Good enough; now we can get on with life. Cyan, which is out now, is one of those novels that never gets into religion. There are thousands of them out there. However I grew up as a fundamentalist Christian, then changed my mind. That means religion plays a big role in my thinking and, therefore, in most of my writing. My first science fiction book, Jandrax, concerns a group of fundamentalists stranded on an unexplored world. The hero is an ex-fundamentalist. Sound familiar? I left all the oddities in place. It is unwise to ignore the gods, or fates, or subconscious, but all my characters ended the book more or less happy with the result of their eternal lives. My latest novel, Like Clockwork, takes place in a world where everybody lives forever, and nobody is satisfied. These are a group of people who were self-chosen for their disbelief, and given an alternative to death. They accepted, but have ended up with a massive case of buyer’s remorse. I can’t tell you more, without giving away the plot, but their version of immortality is pretty screwy. I’m consciously bringing things full circle, with a work that is a deliberate flip side to A Fond Farewell to Dying. There are two — or more — sides to every story. Fortunately, as writers we don’t have to know the philosophical truth of the universe. We just have to tell a plausible tale that resembles reality enough to please our readers. And if we get to exorcise a few personal demons at the same time, it’s a nice bonus. 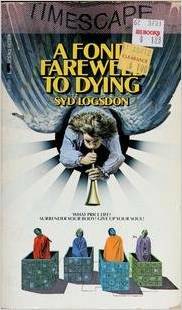 This entry was posted in A Writing Life and tagged literature, memoir, science fiction, writing on September 17, 2018 by sydlogsdon. I’ve been an atheist my entire life, and I’ve never once thought of it as a “solution to life,” satisfactory or unsatisfactory. I wonder if the attempt to find a solution in one or another belief system is an outcome of having been brought up in a religion, which I wasn’t. I’ve often pondered the differences between “converts” to atheism, and what I call “natural atheists,” atheists who have never believed in the existence of a supreme being. Maybe the search for immortality is one of the differences. Not only are “natural” atheists different from “converts to”, but former Southern Baptist atheists are different from former Catholic atheists , or from from former Mormon atheists — naturally, since their childhood experiences were different. Hi, I could answer your implied question, but this will be more interesting. I placed the entire novel in Serial, with commentary, starting May 2018. Jandrax 1 was just about getting an acceptance letter. The second, third, and fourth entries have a lot about how and why, so I am giving you links. Much of the rest is just the novel. Chit chat about the novel came irregularly.